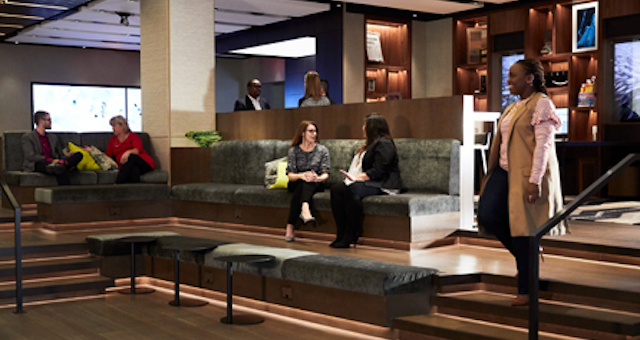 Hilton has today announced the opening of its Innovation Gallery, a first-of-its-kind incubator and experiential showcase for cutting-edge product developments that will shape the future of Hilton hospitality. Open to invited guests including Hilton Team Members, hotel owners and technology partners, the 4,300-square-foot gallery brings together all elements of Hilton’s innovation process. It is a physical space where conversations between thought leaders, design experts and hospitality professionals deliver new products and solutions for Hilton’s guests. “Innovation has been in Hilton’s DNA since entrepreneur Conrad Hilton purchased his first hotel and pioneered the industry nearly a century ago,” said Jon Witter, Hilton’s Chief Customer Officer. “Today, we honor our legacy of innovation with the opening of the Hilton Innovation Gallery – a space for us to incubate, test, scale and showcase the products and processes we’re creating to enhance our guests’ experiences and redefine the future of hospitality,” he said. Hilton has created an immersive experience in the gallery, which mirrors the guest’s experience of a hotel by embedding custom architecture, experiential technologies and cutting-edge materials throughout. Upon entering the space, visitors will make their way through five experiences, the first of which is a product showcase that allows visitors to trial new products like the Nightingale, a noise-masking product; Somabar, a personal mixology solution; Meural, a customisable digital art display; and Pilot, a real-time translation solution. The second stop is a show kitchen that offers visitors the opportunity to experience and showcase the latest restaurant concepts developed by Hilton’s Food and Beverage team, along with technology to film and webcast. The third stop is a Virtual Reality (VR) stage that is a dedicated space for visitors to use virtual reality headsets to experience new Hilton concepts. At launch, visitors will be able to view model rooms from two of Hilton’s newest brands, Tru by Hilton and Canopy by Hilton. The fourth part of the incubator is a ‘darkroom’; a progressive model guestroom dedicated to showing cutting-edge material technologies that have the potential to yield better quality, sustainability, design interest and operational returns. The final stage is the Innovation Theatre that forms the nucleus of the gallery and serves as a gathering space to brainstorm, collaborate and intersect around innovative ideas supported by high-end presentation technology solutions for sound and lighting.